April is National Poetry Month and, as usual, we will focus on Poetry at the monthly meeting. John Jenkinson will be our special guest speaker on the subject. The prompts read in March were outstanding. One was a reading, thank you, Chris. The other was done verbally, thank you, David. Most of us are in awe of the talent we have at KWA. Describe a real or made-up dream or nightmare. What would you do if you were able to communicate with your animals? Have fun with the suggested prompts, or come up with your own prompt. Last month, at the meeting, the stories from the prompts were wonderful, each one so different. Thank you, Chris, Charlie, Tom and Starla for participating. Write about a time in your life when you struggled with a choice and made the right one. What would you do if you were locked inside your favorite department store overnight? What would you do if you could travel in the past? How would you determine if you were in love with the person you are dating or is it just a passing fling? OR you can write about anything you would like. The above are only suggestions. 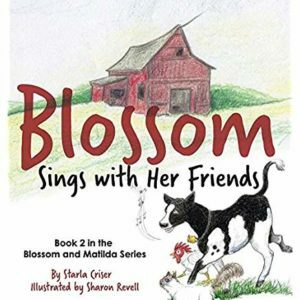 Starla Criser is excited to announce that the second book in her Blossom the Cow Series, Blossom Sings with Her Friends, is now available in hardcover. The book has been updated and given a new cover. Hopefully, the revised paperback will also be available. Z. 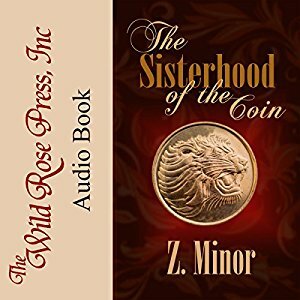 Minor announces that her first book, The Sisterhood of the Coin, is now available as an audiobook on Amazon and iTunes. The reader is Nina Nato. She does a marvelous job with her English accent as she takes you on a trip back in time to 1820 England. Last month, at the meeting, the stories from the prompts were brilliant. Our members come up with such wonderful stories and poems. Thank you, Chris, Gloria, Charlie, and Starla for participating. 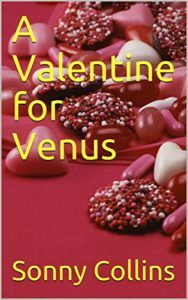 You received a Valentine box of candy, and when you opened the card placed on top, you are shocked when you read who sent the chocolates. Why? Write a story featuring an Ouija board, a search engine, a self-help book. You’re digging in the garden and find a fist-sized nugget of gold. There’s more where that came from in this hilarious story of sudden wealth. Now is your chance to write a short story. I have given you plenty of time? I think! Have fun and see you on February 17th- usual place, usual time. If you saw the original post about a meeting on Cliffhangers and Plotting, disregard that. We will have that program later in the year. Instead we will be having an attorney visit our group. He will answer questions about what an attorney can and cannot do. This information should be helpful to anyone writing about attorneys, or just plain interesting. It’s a new year and time to get motivated with your writing again. That’s what KWA is about: helping each other with motivation, education, and support in many ways. To help with Motivation, maybe you need to do some practice writing. Here are the writing prompts provided by Louise for January, from Brian A. Klems and Zachary Petit – The Writing Prompt Book Camp. 1. You’re downtown, and see graffiti on an unlikely place – graffiti like you’ve never seen before, concerning someone you know. 2. They tour the house with the real estate agent. “We love it,” he said, “Is there anything we should know about the house’s past?” The agent looked down. 3. Write an obituary for your favorite fictional character (literary, television, etc.) including how the death occurred. 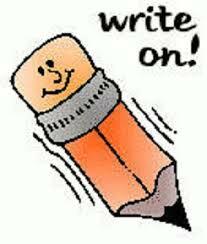 Share your writing at the January 20th meeting. KWA members met in our usual place, at our usual time November 18th. We shared tidbits about what we write and any recent writing accomplishments. We also elected officers for 2018 and did some pretty decent planning for 2018 meetings. There has been a change to our planned August 19th meeting. Our guest speaker had to change her presentation to September 16th. Writing prompts will be discussed. The following are some suggested ones to try out. Harry Potter comes to your house for dinner. Write this scene as if you were a teenager. Job Swap – Take a character from one of your stories and place them in your current job. How does the office respond? Hiring a New villain – Your old villain quit over creative differences, so put yourself in charge of hiring a new villain for your novel. Critique of your work – In an envelope preferably, bring something you would like to have critiqued: a scene, a chapter, a poem, a memoir piece, or an article. We will explain the process at the meeting. The hope is that another member will take it home with them to critique. Put your contact information and the type of project on the outside of the envelope. Dialogue – We will continue discussing dialogue. Bring questions you may have and something to read for feedback. Keep the piece you bring brief so that we have time for everyone. Patton will do a quick overview and have some handouts that will have resources. She will give some marketing pointers and will offer advice on how the KWA members can set themselves up as a self-published author that will help set up the marketing aspect. And she will be happy to answer any questions.